We will post interpretations of the radar as soon as we can. We are currently at a birding and photo festival and have not had solid internet connection. We took a quick look at the Miami and Key West radars and noted some moderate movements, mostly heading from south –> north. With clear skies overhead, birds are flying right past most of our migrant traps. We only expect a trickle of migrants today with the best spots being tried-and-true migrant traps. We will try to update this a bit later today. Hope you all have a wonderful day! 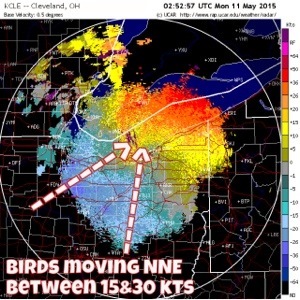 Hi all, A look at radar images this morning proves some birds made the flight north overnight. 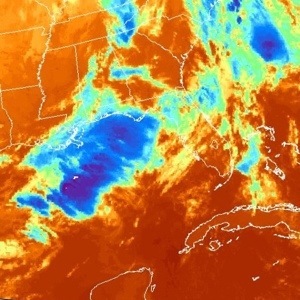 A looming area of instability courtesy of a slow moving cold front is over the Gulf of Mexico. 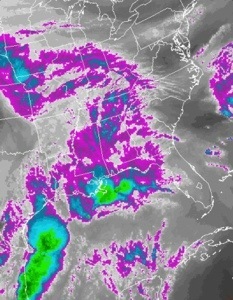 Stormy weather continues to brew and should be making it really hard for migrants that are attempting a Gulf passage this morning. Migrant traps along the west coast of Florida and the panhandle may have the best chances of seeing a concentration of migrants today and tomorrow. Take a look at satellite images of the Gulf and see why we think birds are trapped and may vector birds towards Florida’s west coast. From the SW coast to St. George Island, today is looking like a good day for the birder. We also noticed a roost ring just west of Ft. Lauderdale this morning. As birds are flying out for their morning forage, radar records the group of birds flying out of the marsh. Check out these images. Overall, winds have shifted out of the south (SSW aloft) and should have birds on the wing over the state. Look out for new arrivals at your favorite migrant trap today. If you have time to travel, keep an eye out for reports at classic migrant traps such as Fort DeSoto, St. George Island, Sanibel Lighthouse, Key West and others. The Dry Tortugas may also be seeing some migrants today. Reports of migrants been slow out there this week. Let’s see what today brings! Well the spring cycle continues to be working for the birds because we aren’t seeing them 🙂 Some birds are trickling in here and there, but nothing huge. Unstable conditions persist over the Gulf, as a result we are seeing large thunderstorms making their way towards the coast. This could be making it hard for birds to travel where they want to go, and may put them down along the first stretch of land they find. 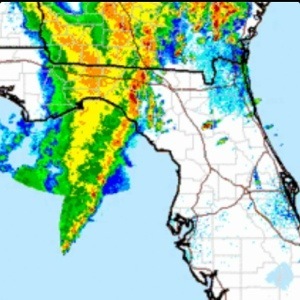 Currently a strong squall line is moving east of Tallahassee, check out the radar image. 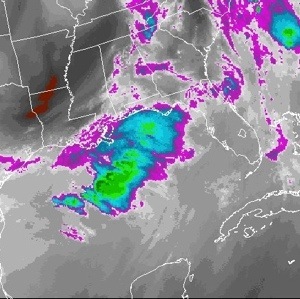 Looks like another Gulf bound migration for the birds. Winds aloft likely carried birds out over the Gulf of Mexico(GOM), if this is the case, birds have it hard. Storms have been brewing in the GOM and coastal locations along their arrival points, essentially blocking their passage. If migrants did indeed fly last night, they will be looking for a landing spot pronto. 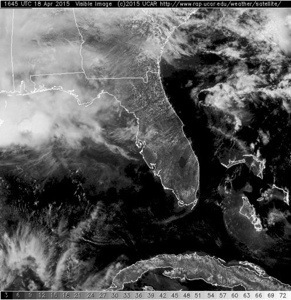 Check out these satellite images of the GOM, here you can see stormy weather which is moving W->E along the coast. 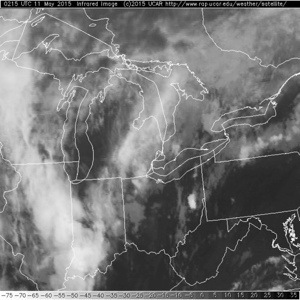 One image is the visible sat the other is a water vapor sat image. 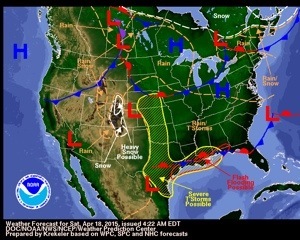 This system will continue its move to the east where it becomes a serious threat to birds migrating. If timing works out right, tomorrow may be a really good to go birding. Depends on how long this system takes to clear out. All we can do is wait and see what happens. Migrants continue to have great travel weather. What works for the birds doesn’t necessarily work for the birders. The spring weather pattern in Florida usually keeps southeast winds on tap, just what a migrant coming from the West Indies wants. 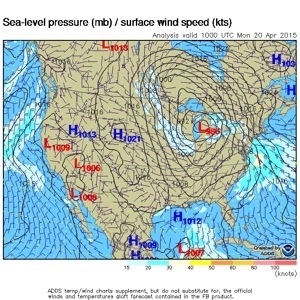 This weather pattern bodes well for long distance travel assisted by tailwinds and clear skies. As migrants continue to take the SE->NW path they will continue to shoot over the SW portions of the state and out over the Gulf of Mexico, nearly cutting their trip north in half. What that means for the birders is simple, go birding and take what you can get while you wait for better birding conditions. So if you are out birding and have not seen many migrants, this is why! 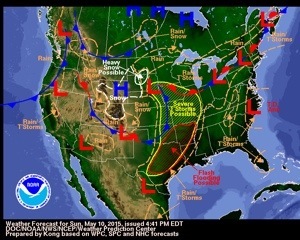 Have patience for the weather pattern is changing up. 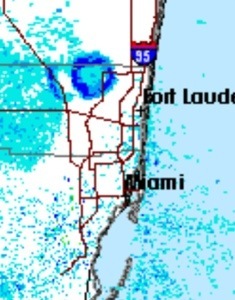 A look at the Key West radar paints the picture of a classic spring migratory movement. Birds depart from Cuba and points farther south or east and ride the super highway to the Gulf coast. Birds want to get there quick, and southeast winds are getting them there. Winds continue to be a birds best friend and not so much a friend to Florida birders. That is a good thing though, birds are making it farther north in short timespans. 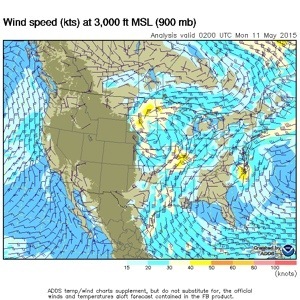 Southeast winds continue to give birds a push to the NW, vectoring them towards AL,MS,LA & Texas. Even if birds were headed for the western panhandle, they would have had a clear passage. 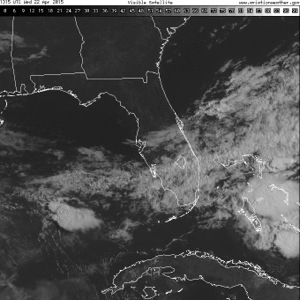 Rain lifted and moved away from the FL panhandle which eliminated the chance of weather driven fallout overnight. Another moderate movement of migrants were recorded on the Miami and Key West radars. Most of these birds undoubtedly flew inland as they were arriving early. Birds that were entering through the east (Miami) could have flown into the natural areas south of Lake O, but there isn’t a whole lot of suitable habitat for migrants in that region. This may mean birds decided to continue on with their journey and may have opted for a long flight that would take them over the SW Florida coast and out over water again. The wonders of bird migration! Where did they go, what were they thinking?! Looks like clear skies and an OK tailwind convinced the birds to go north, leaving us Florida birders high and dry. There is always that chance, that a percent of birds involved with a migratory flight will come in for a drink and a meal, so always be ready for the unexpected during migration. For now we wait for better birding conditions. Forecast models are making the weekend through mid-week look better for birders as a cold front moves in to the NE FL region. If this forecast holds true, we are looking at much better birding conditions for the beginning of next week. The birds are back at it again, migrating from their wintering grounds to their breeding grounds, a mad dash to be the first male on territory. It’s no coincidence that weather phenomenons and bird migration coincide. Every spring, high pressure systems dominate the forecast at many of Florida’s birding destinations. 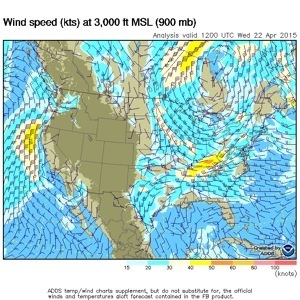 Southeasterly winds persist, helping birds with a serious tailwind that allows them to fly farther, faster and in a northwesterly direction; out and over the Gulf instead of Florida. This route is a risky one for migrants, but remember, it’s a mad dash to be the first male on territory! These neotropical migrants are choosing a route which puts them on a much longer and riskier flight, only one thing can be on their mind, get back home. Only the best survive such a trip! Last night was a great night for migrants once again. Birds had a decent tailwind and southeasterly winds which vectored birds NW. You can see this by looking at the velocity radar loop for Key West. 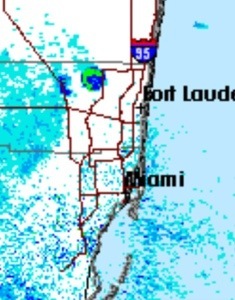 Looks like the Key West radar recorded a moderate movement of migrants out over the FL Straits. 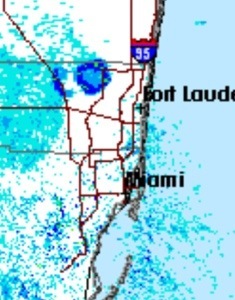 Miami radar shows a small movement out of the Bahamas, but nothing much in the way of bird migration. We await a change in winds to improve birding conditions on the ground for birders, for now, look for those birds that trickle in. There are always some birds that will come in to refuel and rest before they take off again.